We look at these budget options to see if they're worth the money they save. Republic Wireless has been around since 2010, and their initial plan was simple: offer affordable cell phone plans with "Hybrid Calling" technology that focuses on using local Wi-Fi connections for making calls and reducing cellular data. This may sound very similar to a concept called Project Fi that Google launched in 2015. We've already spent some time with Project Fi in the past, and decided to activate the latest Moto E⁴ Plus from Motorola to see how Republic Wireless compares. And as a bonus, we'll also share our impressions on the new Moto E⁴ Plus smartphone. Special thanks to Motorola for providing us with a Moto E⁴ Plus so we could test out Republic Wireless! One of the biggest complaints about the Project Fi service is a lack of compatible devices. The Fi service is limited to the Nexus 5X, Nexus 6P, Nexus 6, and Google Pixel devices. Republic Wireless was also limited to a few phones up until a recent update and the addition of a "Bring Your Own Phone" system. Now, new customers can either purchase one of the eight devices available through Republic — including the Moto E⁴ Plus and Moto G⁵ Plus — or bring one of over 16 compatible phones. Republic Wireless certainly has Project Fi beat on phone selection, with a wide variety of solid phones at various price levels. Once you've installed the SIM card, you'll need to download the Republic Wireless application to begin the setup process and be assigned a phone number. You can also transfer your current number, as long as you verify that it is available to transfer on the Republic Wireless site. The last step is to choose one of Republic's affordable monthly plans. One thing to note before jumping ship to Republic Wireless is that they currently don't offer international calling. They suggest using Wi-Fi with popular apps like Facebook Messenger, or using a local SIM card. Hopefully, the company will add a better solution in the future. If you are rarely near a Wi-Fi signal or use your cell data as a replacement for a home network, Republic Wireless is not for you. This service is specifically meant for customers who are on Wi-Fi for at least half the day, and only need data for directions or light streaming while not at home or in the office. The cheapest Republic Wireless plan will cost you $15 per month, but it only includes the ability to talk and text without any data. The basic data plans are 1GB, 2GB, and 4GB at $20, $30, or $45 a month, respectively. They have also added both a 6GB ($60/month) and 10GB ($90/month) plan for months where you may need the added freedom. Unlike Project Fi, which allows you to go over your data plan at a rate of $10 per gigabyte of data, the Republic data is capped and will simply be cut off once the limit is reached. However, you can change your phone plan at any time during the month and instantly add more data. Sadly, the cost of any unused data will not be refunded like it is with the Project Fi plan. For our testing, we chose the 2GB plan for $30/month and set out to test the strength of the 4G LTE network. Your experience will vary based on location, but the Sprint network is a bit weaker than most, even in the Los Angeles metro area where we tested. The benefit of being able to connect to multiple networks on Project Fi became apparent, as the connection speeds were less reliable when traveling on the Republic network. The price for the standard 16GB Moto E⁴ Plus is $199, but you can currently purchase the 32GB model from Republic Wireless for only $179. Our test model was 16GB variant, and arrived in the Fine Gold color. The Moto E⁴ Plus features a vivid 5.5-inch IPS display, 2GB of RAM, a 13MP rear camera, and a massive 5,000 mAh battery. In fact, the Moto E⁴ Plus has one of the largest batteries available in any smartphone on the market, regardless of price level. This means it can go days without being charged, and we saw an average "screen on" time of around seven to eight hours. When you do charge the phone, it uses Motorola's fast charging technology to help keep that large power reservoir filled. While we have discussed that many users won't ever use something as large as 256GB of phone storage, 16GB is a bit too small. We installed about 20 applications for testing, and the phone storage showed only 3GB remaining with our "essentials" installed. Thankfully, the Moto E⁴ Plus can accept a Micro SD card with up to 128GB capacity to alleviate that problem. The Moto E⁴ Plus has some features you'd expect from a modern premium phone, including a fingerprint reader, but it lacks NFC or the ability to use Android Pay. The Moto Actions are present, but only feature the ability to use the fingerprint reader to navigate by swiping your finger in a specific direction. Gone is the "twist" motion to activate the camera and the double-chop to turn on the flashlight. The Snapdragon 427 processor and the 2GB of RAM have no issues running notoriously hungry applications like Snapchat, and will be fast enough for most users. The camera is comparable to the Moto G5 Plus we had tested, and the photos tend to be oversaturated. In bright lighting, we were able to capture the green Mercedes pictured below with both an iPhone 7 and the Moto E⁴ Plus. You can see that the E⁴ Plus camera tends to increase the color a bit much, and you lose some detail in your shots. 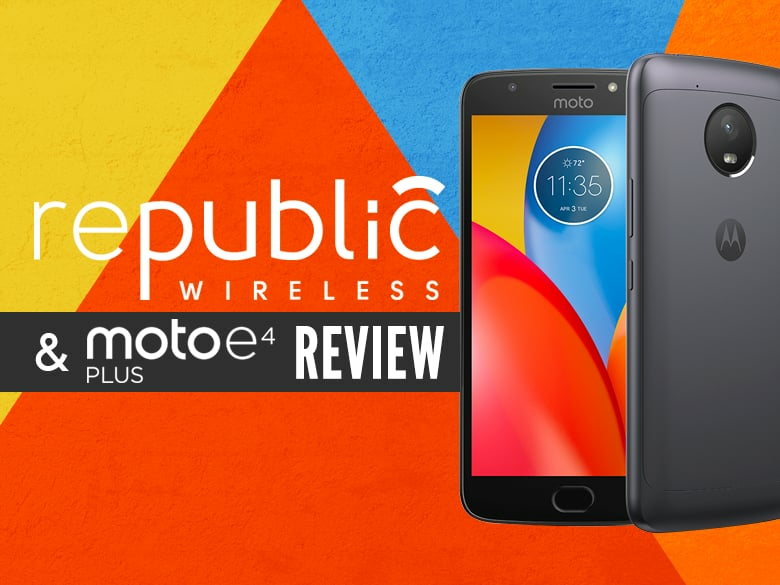 Overall, the Moto E⁴ Plus paired with the Republic Wireless network is worth considering for anyone tired of a triple-digit phone bill and $1,000 phones. Republic Wireless continues to improve, and a growing number of affordable phones, like the Moto E⁴ Plus, help open the service to a wider audience than Google's Project Fi. Similarly, Motorola has continued to expand its product line to try and offer phones for customers who simply want the basics. Despite its flaws, the Moto E⁴ Plus excels at simply providing a reliable day-to-day phone with great battery life. For some people, what more could you need? Images courtesy of Republic Wireless, Motorolla.